with wounds that are likely to stick to the wound, leave lint, or be difficult to remove. Bandages are strips or rolls of gauze or other materials that are used for wrapping or binding any part of the body and to hold compresses in place. The types of bandages that are most com- monly used are the roller bandage and the triangular bandage that can be used to make the Barton bandage and the cravat bandage. Figure 4-25.Applying a roller bandage. The roller bandage, shown in figure 4-23, con- sists of a long strip of material (usually gauze, muslin, or elastic) that is wound into a cylindrical shape. Roller bandages come in various widths and lengths. Most of the roller bandages in the first aid kits have been sterilized, so pieces may be cut off and used as compresses in direct con- tact with wounds. If you use a piece of roller ban- dage in this manner, you must be careful not to touch it with your hands or with any other unsterile object. A piece of roller bandage maybe used to make a four-tailed bandage. This is done by splitting the cloth from each end, leaving as large a center area as necessary. Figure 4-24A shows a bandage of this kind. 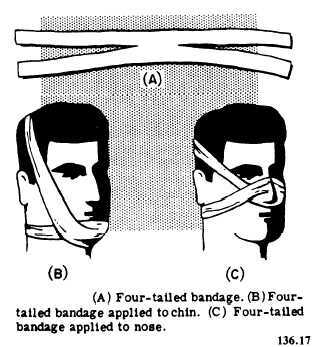 The four-tailed bandage is often used to hold a compress on the chin, as shown in figure 4-24B, or on the nose, as shown in figure 4-24C. It is good for bandaging any protruding part of the body, because the center portion of the ban- dage forms a smoothly fitting pocket when the tails are crossed over. In applying a roller bandage, hold the roll in the right hand so that the loose end is on the bot- tom; the outside surface of the loose or initial end is next applied to and held on the body part by the left hand. The roll is then passed around the body part by the right hand, which controls the tension and application of the bandage. Two or three of the initial turns of a roller bandage should overlie each other to secure the bandage and to keep it in place (see figure 4-25). In applying the turns of the bandage, it is often necessary to transfer the roll from one hand to the other. Bandages should be applied evenly, firmly, but not too tightly. Excessive pressure may cause interference with the circulation and may lead to disastrous consequences. In bandaging an extremity, it is advisable to leave the fingers or toes exposed so the circulation of these parts may be readily observed. It is likewise safer to apply a large number of turns of a bandage, rather than to depend upon a few turns applied too firmly to secure a compress.